Nashville, TN -- Mountain Song at Sea is making waves sailing from Miami to Great Stirrup Cay with the biggest names in bluegrass music, Feb 1-4, 2013. Steep Canyon Rangers and Sixthman have partnered to give away a cabin for two on board the inaugural voyage of this large-scale bluegrass music festival at sea. Atlanta GA/Spring Valley, CA -- September 18th, 2012 - Acclaimed banjo manufacturer Deering Banjos and Sixthman, industry pioneer of the music festival at sea concept, today announced a strategic partnership that combines best in class banjo content and knowledge with Sixthman's newest sea-based music festival, Mountain Song at Sea, to give consumers of both brands an opportunity to experience the best of bluegrass. 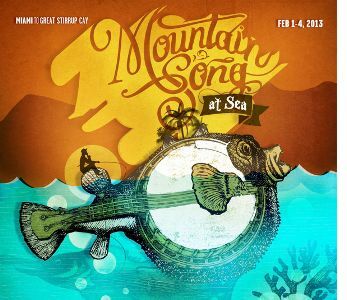 The partnership will help fans discover The Mountain Song at Sea music festival and give attendees access to Deering Banjo's renowned instruments while sailing to Great Stirrup Cay, Bahamas. Nashville, TN -- In an exciting new membership drive, all active members of the International Bluegrass Music Association (IBMA) as of September 27, 2012 will receive a chance to win an oceanview cabin for two on Mountain Song at Sea’s Bluegrass Cruise. An entire ship has been chartered for the festival, which boasts a fantastically diverse lineup: The David Grisman Sextet, Del McCoury Band, Punch Brothers, Steep Canyon Rangers, Tim O'Brien and Bryan Sutton, Kruger Brothers, Peter Rowan, Larry Keel & Natural Bridge, Travelin' McCourys, Shannon Whitworth, Della Mae and Town Mountain. Atlanta, GA -- The first ever bluegrass muisic festival at sea will set sail on board the Norwegian Sky from Miami to the Bahamas on February 1, 2013. Mountain Song Productions and Steep Canyon Rangers have partnered with Sixthman to present the inaugural voyage of Mountain Song at Sea, the only bluegrass festival experience on the ocean.